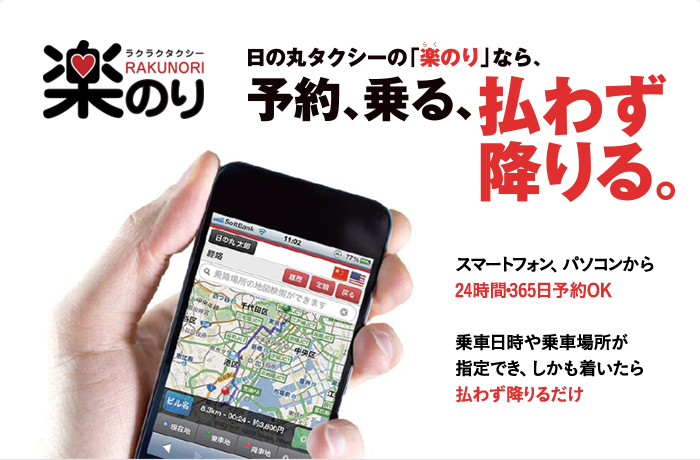 "Rakunori" you can make the reservation even from a mobile smartphone and PC, at any time in a 24-hours 365-day a year. Even when you cannot talk with the cell-phone in the meeting or a train, you can make a reservation. To make a sign-inon Rakunori,you can omit input such as necessary contact information at the time of a reservation you sign- in and it is very convenience. In addition, you can easily reserve the use ride place, getting off place from a ride historybecause a ride place that you used, getting off place can register. Paying at the time of the getting off is unnecessarywhen you make a reservation for rakunori. In addition, "the corporation ticket" that cash payment becomes unnecessary is available to the corporations. Even a ticket reply can take it.